From her first love of creating photo-realistic human portraits, Rebecca has since developed a passion for portraying the wild creatures in a more unique and personalized style. 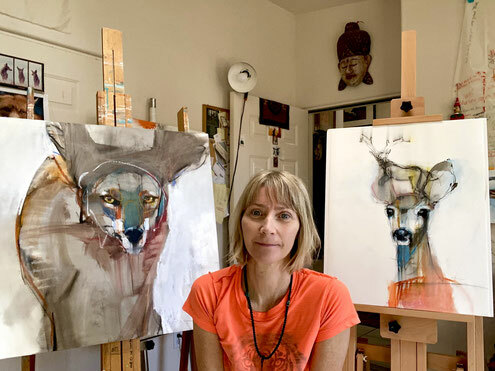 While maintaining a strong and accurate suggestion of form and likeness, her palette and mark-making choices now venture into a more abstract dimension which allows for a connection to something larger than just the realistic portrayal of an animal's shell. Rebecca was born in Wyoming with a vast array of creatures to inspire her. She started drawing as soon as she could hold a pencil but didn't begin with animals until around the age of 30. Up until that time, she drew people, primarily faces, perfecting her skills to the point where she could create astonishing photo-realistic portraits. While pursuing her fine art degree in Denver, Rebecca began working at a Southwestern/Native American art gallery where she would become Gallery Director upon graduation and work (and sell her own paintings) for the next seven years. A friend lent her a book about the spiritual nature of animals and our connection to them. That book inspired her to start experimenting with animal imagery and exploring the diverse cultural associations attributed to creatures since the beginning of time. Rebecca went on to manage a Native-owned art gallery in Berkeley, CA and after immersing herself in this rich culture for many years and soaking up the both playful and sacred animal stories of peoples all over the world, she was hooked. Many of her images come from animal dreams where the creatures visit her. She believes that they have messages for us, lessons to teach, and that she is being asked to communicate this through her paintings. The more she honors these beings, the more they come to her in dreams. They stir a magical world within her that reveals to her eye a more mystical, magical world on the outside as well. Rebecca mixes oil paint and china markers (grease pencils) on her wooden surfaces. She prefers the strength and feel of the wood over paper or canvas. She begins with an image in mind and then follows where it leads, allowing the essence, or true spirit of the animal, to emerge now rather than confining it to its physical attributes alone. Often her pieces suggest a story or fable that may include a trickster of sorts or spirits that are part creature and part human.